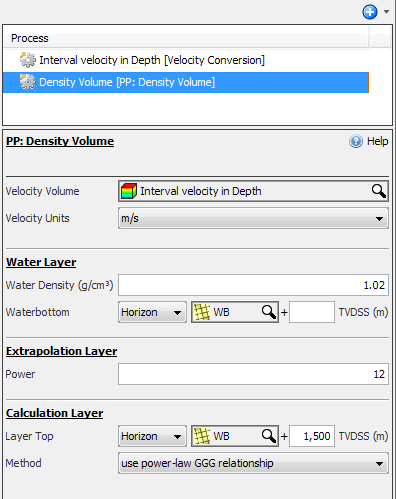 Description Calculate a density volume from velocities (for pore pressure prediction). This process creates a new density volume for use in pore pressure prediction (see PP: Eaton Pressure Volume and PP: Miller (No Unloading) Pressure Volume). The calculation depends on the selected parameters. To fully read and understand the fundamental theory behind the different methods used for pore pressure analysis, see the Pore Pressure Prediction chapter, specifically Module Summary and 3D Model Building. This process is configured in 3 layers. Select an interval velocity model at Velocity Volume and define the Velocity Units. The interval velocity must be a depth volume (see Velocity Conversion to convert the velocity, which we recommend that you QC it to ensure that the interval velocities are sensible). Define the Water Density and Waterbottom. You can use a constant depth or a horizon to define the waterbottom. If a horizon is selected, you can input a constant value to offset the horizon. If a waterbottom horizon is not supplied, then the water layer has zero thickness. This layer begins at the top of the Calculation Layer, extrapolating smoothly up to the water density above. The shape of the extrapolation is a power-law curve, the exponent of which is set in the Power parameter. Define the Layer Top using a constant depth or a horizon. If a horizon is selected, you can input a constant value to offset the horizon. The layer top defines the boundary between the Extrapolation Layer and the Calculation Layer. The result will be in the unit selected in the drop down next to the formula. 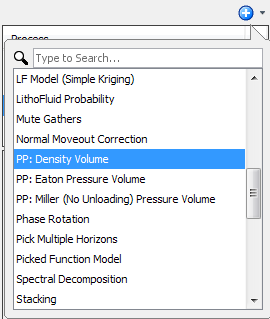 As a result of this process, the density volume will be added in the Volume tab. Gardner, G.H.F., Gardner, L.W., and Gregory, A.R., 1974, Formation velocity and density - The diagnostic basics for stratigraphic traps. Geophys., 39, 770-780.